The Tun Abdul Razak Memorial was opened in 1982 to commemorate the life and times of Tun Abdul Razak who served as the second Prime Minister of Malaysia from 1970 - 1976. 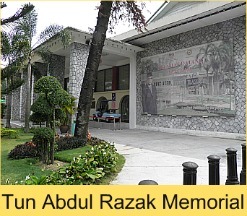 It is housed in the Sri Taman Building which was the official residence of Tun Abdul Razak from 1962 until his death in 1976. The first section provides a biography on the man who was highly regarded as an effective administrator and known for his contributions to rural development and social justice. He was nicknamed 'The Father of Development'. This section contains many of his personal possessions including his collection of walking sticks, his favourite golf buggy and speed boat. Also gifts and souvenirs that he received in the course of his official duties. Interestingly, his bedroom and study have been preserved with their original 1960s/1970s furniture which must have been state-of-the-art when it was first purchased but now looks very outdated. The second section is a collection of over 1500 materials concentrating on his activities and achievements while serving as a Minister and, later, as Prime Minister. Outdoor exhibits include an example of a modest pre-fabricated FELDA (Federal Land Development Authority) house of the type that was provided to low income families under their settlement scheme. Originally there would have been only one water pipe for every 6 families but nowadays each home has its own water supply. 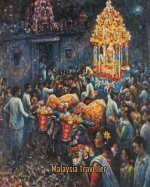 More of relevance to historians and scholars who wish to study Tun Abdul Razak's contribution to the development of Malaysia but it is also of interest to the casual visitor, particularly the personal items and the furniture relating to the period. Entrance is free and it is close to the other Lake Gardens attractions so why not pop in and take a look? Closed on Mondays (except during public holidays and school break). You can find a map on my Kuala Lumpur Lake Gardens page. 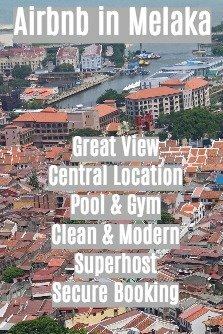 The old Kuala Lumpur railway station is the closest stop. You can walk to the museum as part of my Kuala Lumpur Lake Gardens trail.